#7246 is approximately 12.5" tall and the mirror base is about 5-1/4" dia. with approximately 10.5" hanging distance from mirror to hook. Rubber pads on the bottom prevent furniture scratches. #7294 is approximately 12" tall and the base is about 5-1/4" dia. with approximately 9" hanging distance from base to hook. Stand is made of metal and brass plated. #7247 is approximately 12.25" tall and the base is about 5-1/4" dia. with approximately 10.875" hanging distance from base to hook. 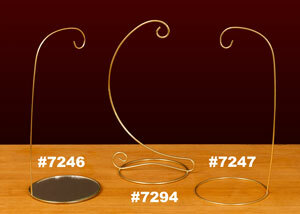 Stand is made of round metal and brass plated. #7250 is approximately 14.25" tall and the base is about 5-1/4" dia.This 4 tier stand has hanging distances of 12", 10.5", 9" and 7". Stand is made of round metal and brass plated. #7295 is approximately 10.5" tall and the base is about 5-1/4" dia. This 3 tier stand has hanging distances of 8.5", 7", 5.5".Stand is made of round metal and brass plated. #7249 is approximately 7" tall and the base is about 3-1/4" dia. with approximately 6" hanging distance from base to hook. 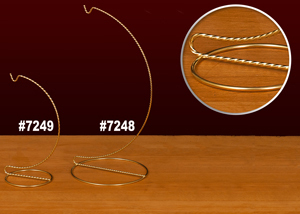 Stand is made of twisted metal and brass plated. #7248 is approximately 11" tall and the base is about 5-1/4" dia. with approximately 11" hanging distance from base to hook. 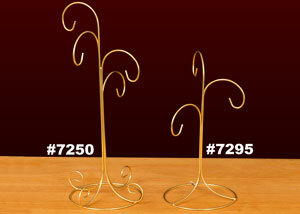 Stand is made of twisted metal and brass plated. 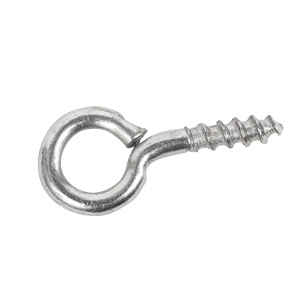 These are some of the smallest eyelet screws you will find and they are perfect for hanging small items like turned Christmas Tree Ornaments and more. The screws are available in two different varieties: Nickel plated steel and Brass plated steel and both have 3mm eyelets. Comes in packs of 100.